Despite the US telecom agency plans new spectrum auction to speed 5G networks and the chairman of the Federal Communications Commission said that they plan to launch new auctions of high-band spectrum this year and dismissed a possible agreement with Huawei, pointed by the Intelligence Department finger as a possible spy company, Huawei is running up with the commercialization for next-generation 5G wireless network. Huawei CEO Ken Hu said to reporters at annual Mobile World Congress in Barcelona, he welcomed “factual debate” about any security concerns governments or network operators may have about security threats arising from its products”. The Chinese telecom enterprises may sign 30 pre-commercial agreements with network operators of that technology. As a possible strategy planned by US telecom enterprises, Treasures Department in a complot with Intelligence Agencies, have indicted Huawei as a potential spy for China Government. US House Energy and Commerce Committee’s Chairman Greg Walden was clear on his statement in the Congress. He said that the running to 5G is a sprint, not a long breath running, and the proposed spectrum auctions will help ensure the United States at the forefront of this emerging technology. On the other hand, the chairman of the Federal Communications Commission Ajit Pai said that they wanna to lead the world in 5G. Actually, they are sure that they will able to reach a major spectrum auction in November, an interesting statement that clarifies any doubt about US goal with the 5G market, which poses facts about Huawei, a Chinese company who can tackle down Americans competitors. But the Chinese enterprise doesn´t care and it seems it is a good time for business. Actually, they tightened commercial links with big telecom operators across Asia, Americas and Europe, and positioned the company on the top of the global race for future 5G networks. Seoul, Tokyo, London, Milan and Vancouver are one of the biggest cities that thanks to commercial pre-agreement will have 5G. That proves the theory of many political analyzers that Washington policies and new government are far from approaching commercial, political and military issues but turning away. Also, they dismissed Washington accusations and do not share White House’s paranoia about security concerns. But the US put the finger on the wound and as a way to pressure they raised security concerns about Australian government as a consequence of Huawei’s role in building communication networks there. Currently, Huawei has signed 5G field trial agreements with 45 operators, declared Ken Hu. According to Reuter’s data, around 25 of those pre-commercials have been performed openly.Sweden’s Ericsson, No.2 mobile networks supplier, has 38 x5G operator partnerships publicly announced, while No.3 mobile supplier, 31 network operators worldwide. However, Nokia spokesman said that they have 5G research and development with 43 of its top 50 customers. There is a great expectation around 5G commercialization and service. 2018 will mark the beginning of the running to conquer the market. Huawei has seen the blossom of real demand for 5G technologies. Next decade is promising for telecommunication and mobile equipment providers, which visualize a network upgrades around 2020. Huawei reported a $92 billion profits in 2017, but growth slowed down to 15 percent from the 32 percent achieved in 2016, and the 37 percent in 2015. Media and experts speculate Huawei’s target will be more than $102 billion in 2018. The strategy for the current year on 5G development and trade all over the world has been defined by the CEO of the third most important mobile producer. Huawei has 3 arms: Business operator, enterprise and consumer. He stated they will have a beneficial growth but didn´t specify business targets. About US Senate and Intelligence Department, Huawei CEO considers that US Senate hyperbolizes the whole deal of security threats through Huawei flaws. The company thinks that is a suspicious comment intended to avoid the participation of China 5G telecommunication equipment in the United States, leaving a freeway to American companies. The irony lies in the fact that it was recently probed that neither Russian nor Chinese enterprises left flaws. It was US companies wholeft security fails and they didn´t report it. 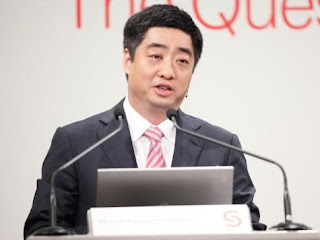 Ken Hu thinks that statements about Huawei security are not based on solid facts and it is a pity that kind of things happens in the business world, a thing that “they are very sorry about”. Hu replied to reporters during the Mobile World Congress in Barcelona when he was questioned about it. Hu added his company is willing to work with authorities to get rid of the fears they may have. However, Hu has agreed on one point: US security officials have made deeper security threats, lurking in the extended supply chains of thousands of partners of which Huawei and other network suppliers must rely upon to develop, produce and distribute their products around the world.